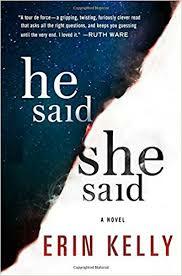 Thursday, Sept 20 at 6:30 p.m. Join us as we discuss He Said, She Said by Erin Kelly. “In the summer of 1999, Kit and Laura travel to a festival in Cornwall to see a total eclipse of the sun. Kit is an eclipse chaser; Laura has never seen one before. Young and in love, they are certain this will be the first of many they’ll share.